The Canon PowerShot G12 has taken an energy shot of excellence and sprinted to the finish line to be pronounced the Digital Camera of the Year at the 2011 T3 Gadget Awards. Coming up against colossal competition in the form of the class-leading Canon EOS 600D and the retro-titan that is Fujifilm's FinePix X100 the G12 showed premium style alone is not enough to walk away with a coveted T3 Award. Despite its larger form-factor the G12 was crowned T3 Gadget Awards 2011 Digital Camera of the Year by combining the ease-of-use of a compact camera with the more heavy-duty features and impressive picture quality normally associated with a full DSLR. Despite the lack of changeable lenses the Canon PowerShot G12 boasts a range-topping 10-megapixel sensor alongside 720p HD video-recording capabilities at 24fps. You also get the handy HDR mode which featured on the IXUS 1000; by taking three separate images at slightly different exposure levels the camera then combines them to drastically improve exposure issues. For those who like to be a bit more hands-on however there's an impressive amount which can be customise. A dedicated ISO dial is neatly perched upon the travel friendly snapper alongside the ability to customise two favourites modes. While its appearance may initially come across as slightly bulky, don't let that fool you. Smaller than a DSLR the G12 still feels solid and weighty in the hand giving across a premium feel that helps remind us of its SLR heritage. The swivelling 2.8-inch display adds to this, giving the camera a feature that many of its high-end competitors are still missing. 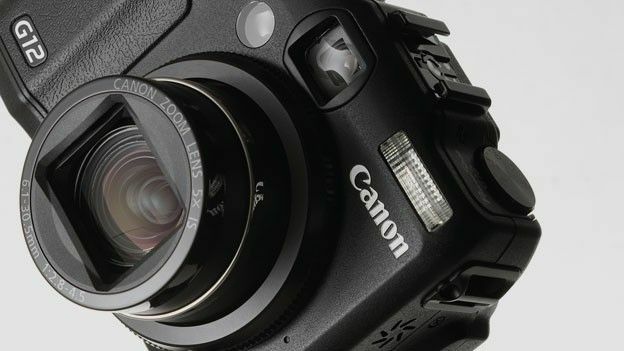 Is the Canon G12 the rightful owner of the 2011 T3 Gadget Awards Digital Camera of the Year crown or would you have gone for one of the other shortlisted devices? Let us know via the comments box below, and don't forget to check out the rest of the night's winners in our T3 Gadget Awards feature.